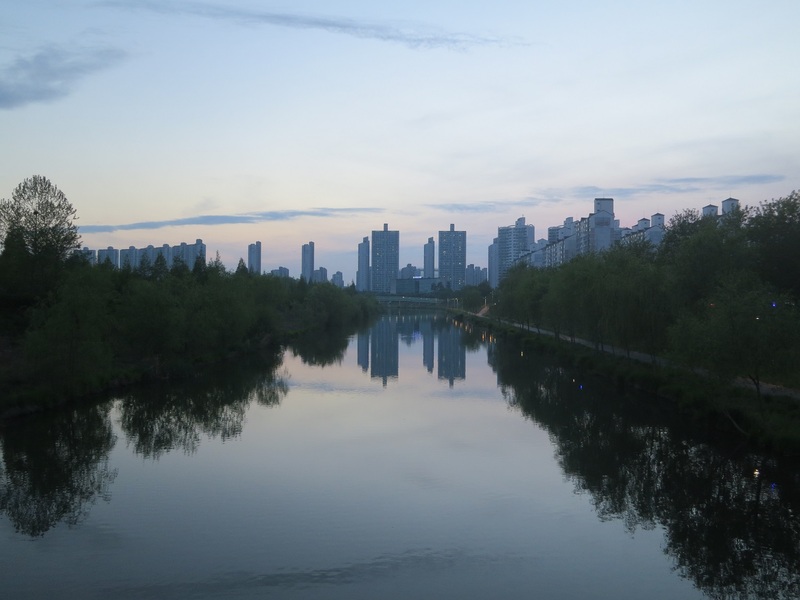 Ansan, Gyeonggi-do, 5 May 2017, 6:30pm. It is said that at the height of his efforts to build the Republic of Korea into an economic powerhouse, Park Chung-hee happened to be flying in a helicopter over western Gyeonggi-do. He looked out and saw what he considered to be a lot of under-utilised real estate, and decided that it should be designated for industrial production. Thus started the rapid growth of Ansan, a city which became known for its foreign migrant workers labouring in the factories. But as Korea has begun to be undercut by China in terms of production costs, Ansan has gone into something of a decline. The city, which since 2001 has been home to Seoul Institute of the Arts, has tried to combat this decline through artistic endeavours, and the Ansan Street Arts Festival is one of those regeneration initiatives. The festival has been going since 2005, and its 2017 iteration had 76 acts from 14 different countries, including two troupes from the UK as part of the 2017-18 UK-Korea cultural exchange programme, in which Ansan has developed a commissioning partnership with Yorkshire’s Stockton International Riverside Festival. Over the three day Ansan festival, the Whalley Range All Stars performed Ye Gods and Company Chameleon performed Push and Hands Down. 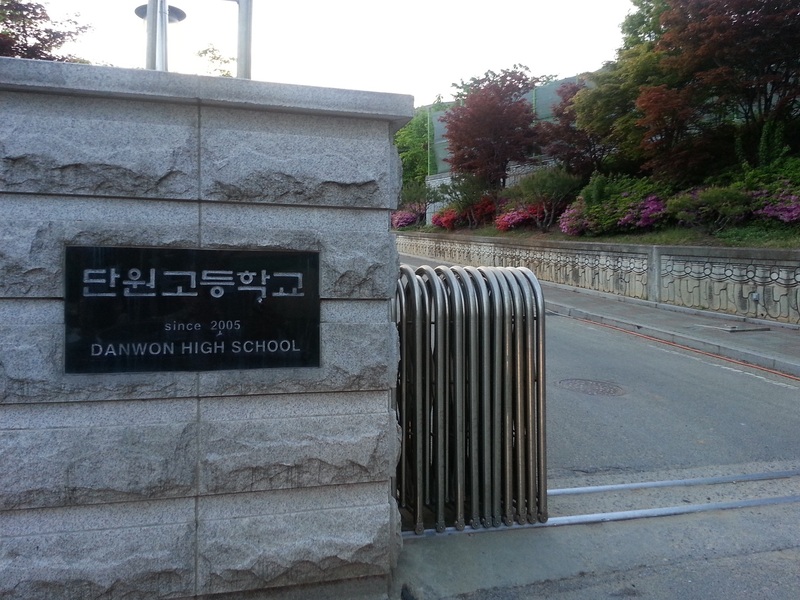 Ansan is also known for being the home of Danwon High School. 325 of the school’s junior class and twelve of its teachers were on the Sewol Ferry when it sank on 16 April 2014. As we were in the area, we paid the school a visit, little knowing how central the school’s tragic past was to be in the upcoming evening performance. We were not the only ones to have paid a pilgrimage to the school’s gates. A notice outside asked visitors to respect the school as a place of learning; visitors such as the press were requested not to enter the school precincts until after the school day had finished at 5pm. The Street Arts Festival takes place in a huge kilometer-long public space which leads southwards from the city hall as far as Ansan Lake Park on the south side of the Ansan Stream which flows the short way out into the West Sea. I am always a little sceptical of the statistics for visitors at Korean festivals – according to the current Wikipedia entry more than the total population of South Korea managed to visit the 2008 festival – but on that first evening on 5 May I was amazed at the number of people happily thronging the squares and side streets: it could easily have been over a hundred thousand. We wandered through the performance area, standing on tiptoe to look over the crowds at the various performers: acrobats, musicians, mime artists and more. At the northernmost point of the festival precincts our path was barred by a few hundred students dressed in white, carrying white balloons. Chris said she had heard that there was going to be a Sewol-related parade or demonstration later on that evening. We turned around and headed back to the central area, where Chris said the main opening performance (involving half a dozen mechanical diggers) would start at around 8:30pm, wondering how, if at all, the two seemingly conflicting events would interact. At this point, a quick linguistic aside. 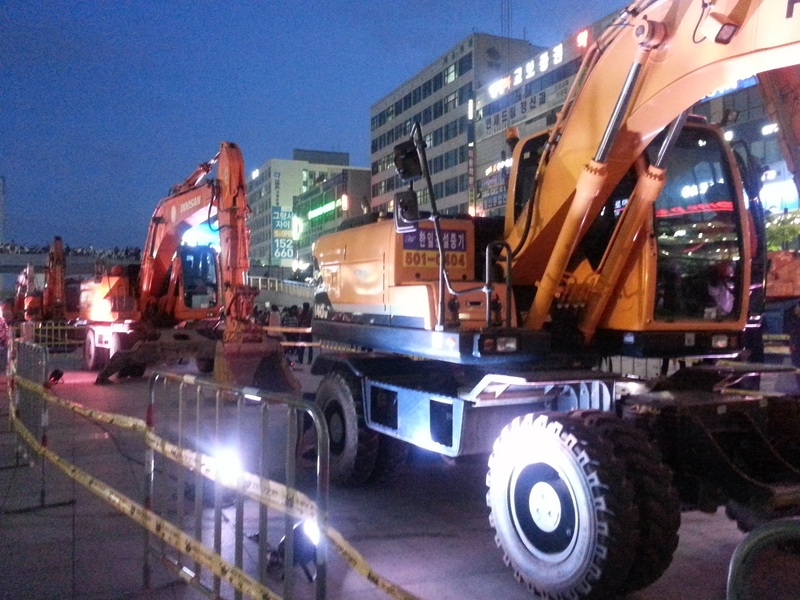 The Korean for mechanical excavator is 포크레인 – a very strange word. Ask a Korean what it means and how it came to mean that, and you will probably be told that it is a Konglish word: a conflation of 포크 (for fork lift truck) and 크레인 (for crane), giving you something in between: a digger. But another more diligent Korean told me that 포크레인 is simply a transliteration of Poclain, the French company founded in 1927 and best known for its construction equipment. 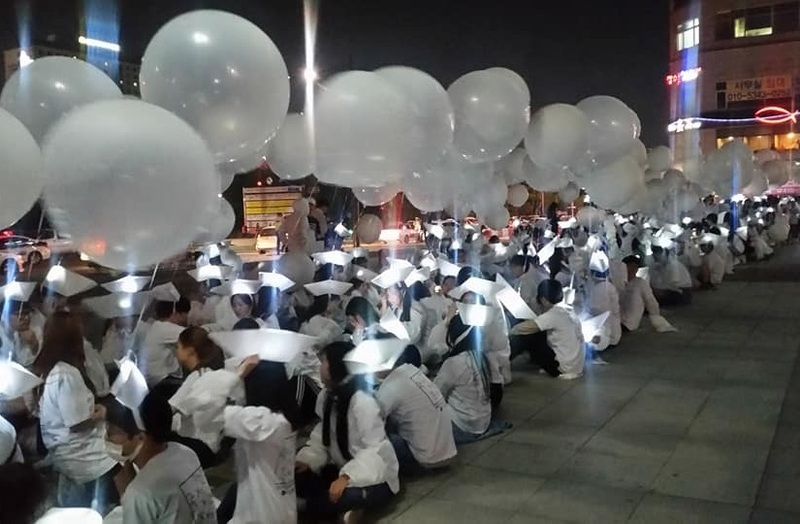 A performance involving around 400 students, acrobats, half a dozen mechanical excavators, a live symphony orchestra, a deep sea diver suspended from a crane, and much more, in a seventy minute piece whose aim was to try to enable Ansan to come to terms with its grief following the loss of so many of its children in the Sewol Ferry disaster. While the performance was meticulously non-political and carefully avoided criticising the rescue efforts, it was probably something that could not have happened if President Park had still been in power. 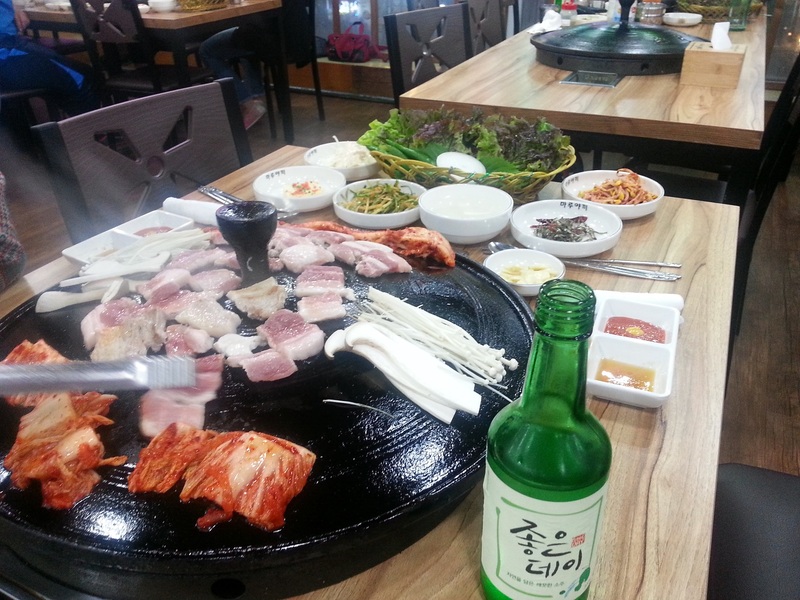 The crowds began to disperse at 10pm, but fortunately you could still find restaurants open, and sampgyeopsal with my favourite brand of soju was the perfect way to end the day (though the mixed martial arts showing on the wall-hung TV wasn’t quite in accordance with the mood of the evening). At 11pm the roads are empty, and Chris kindly drives me back to my hotel in near Jogyesa before heading home herself. The Ansan Street Arts Festival 2017 was held 5 – 7 May 2017 in downtown Ansan.